A surprising shape for a stool, it's also what makes it a fun place to sit. The seat is geometrically shaped like a triangle with soft corners, so there's no front or back, making it a comfortable spot from which to perch from any angle. The compact size and shape is ideal for small spaces and you'd be surprised at how many you can have in one room without feeling crowded. Because of its unique ergonomic shape and candy colors, the stools is great for extra seating at parties, as a stool for a child’s activity table, or even carry to a sporting event for lawn seating. 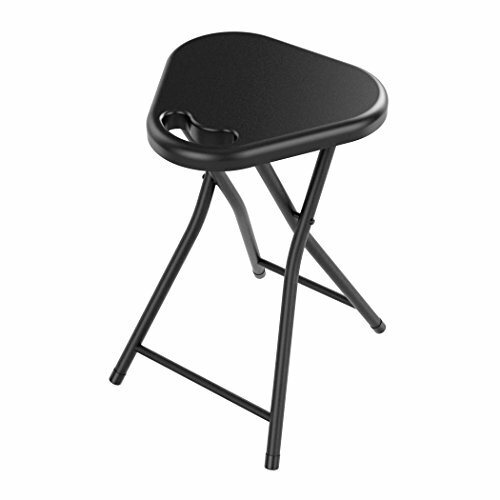 All around this stool is an essential for the home. The best part, it folds right up and features a convenient handle for easy transporting. While it's lightweight, it's sturdy enough to accommodate up to 250lbs of weight. Made of a durable, easy-to-clean hard plastic seat and metal legs, the stool comes in a variety of vibrant colors to suit any room or palette. No assembly required.